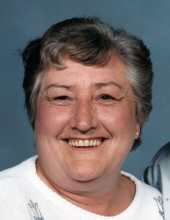 Nancy Lee Ashwell, age 83, of Union Bridge and formerly of Baltimore, died Wednesday, April 3, 2019 at her daughter’s residence. Born December 25, 1935 in Baltimore, she was the daughter of the late Edward and Alice Weber Griffith. She was the wife of Kabler Dale Ashwell who died in 2007. Nancy enjoyed her family and in earlier years watched her grandchildren and took pleasure in cooking for them. She was a member of the Seaside Red Hatters of Ocean City. Surviving are children, Charlene Johns and husband Rick of Union Bridge, K. Dale Ashwell Jr. and wife Denise of Woodbine and Mike Ashwell and wife Judy of Sykesville; sister, Darlene Beck and husband Mike of Joppa, 10 grandchildren, 14 great grandchildren and daughter-in-law, Joanne Ashwell of Westminster. She was predeceased by son, Eddie Ashwell in 2006, granddaughter, Jenny Ashwell in 2013 and brother, Edward Griffith. A funeral service will be held at 3:00 p.m. Sunday, April 7 at St. James Lutheran Church, 14 S. Benedum St., Union Bridge, with grandson, Rick Johns Jr., officiating. The family will receive friends at the church from 2:00 p.m. until service time. Memorial contributions may be made to help defray expenses, c/o Hartzler Funeral Home, P.O. Box 249, New Windsor, MD 21776. To send flowers or a remembrance gift to the family of Nancy Lee Ashwell, please visit our Tribute Store. "Email Address" would like to share the life celebration of Nancy Lee Ashwell. Click on the "link" to go to share a favorite memory or leave a condolence message for the family.